PT Bank Central Asia Tbk - BCA (IDX:BBCA) or referred to as "Bank BCA" is a reputable and trusted privately-owned bank in Indonesia. The Bank is recognized as one of the largest banks in Indonesia. 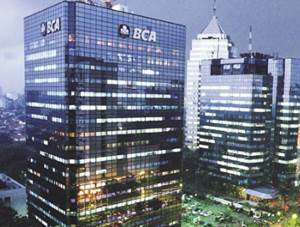 Bank BCA is positioned inside the top three of Indonesian banks in terms of total assets. According to PT Bank Central Asia Tbk First Nine Months 2015 Results as cited by JobsCDC.com, the Bank booked total assets of Rp 573.16 trillion (unaudited, bank only) as at the end of September 2015 (9M 2015). Bank BCA is based in Jakarta and runs its business through 1,111 outlets and 16,694 proprietary ATMs throughout Indonesia. PT Bank Central Asia Tbk also supported by 6 key subsidiary companies; namely BCA Syariah, BCA Finance, BCA Insurance, BCA Finance Limited Hong Kong (BCAFL), BCA Sekuritas, and BCA Life. In term of financial performance, Bank BCA has recorded a significant growth and satisfactory performace in 9M 2015. Referring to its First Nine Months 2015 Results, PT Bank Central Asia Tbk booked total net profit of of Rp 12,919.54 billion (unaudited, bank only) in 9M 2015. This reflected a 9.71% growth as compared with total net profit in the same period at previous year (9M 2014) of Rp 11,775.88 billion (unaudited, bank only). Male with a maximum age of 25 years old. S1 Accounting, Management, or other related majors. Have a GPA of at least 3.00 on a scale of 4.00. For experienced candidates are welcome to apply, preferably from the banking industry (if any). Fluent in foreign language(s) such as English, Japanese, Chinese, Korean (preferred). JobsCDC.com now available on android device. Download now on Google Play here. Please be aware of recruitment fraud. The entire stage of this selection process is free of charge. PT Bank Central Asia Tbk - Fresh Graduate International Banking Staff BCA June 2016 will never ask for fees or upfront payments for any purposes during the recruitment process such as transportation and accommodation.